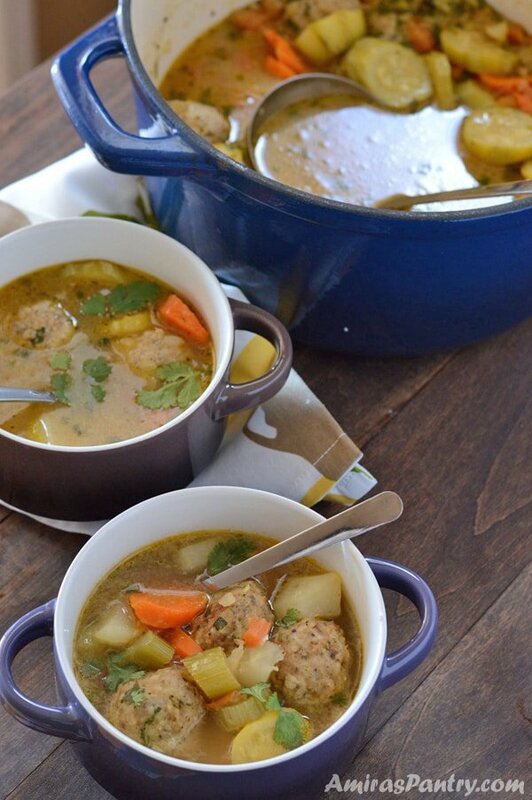 Albondigas Mexican soup is a meatball soup that in incredibly tasty, full of flavors and loaded with vegetables. 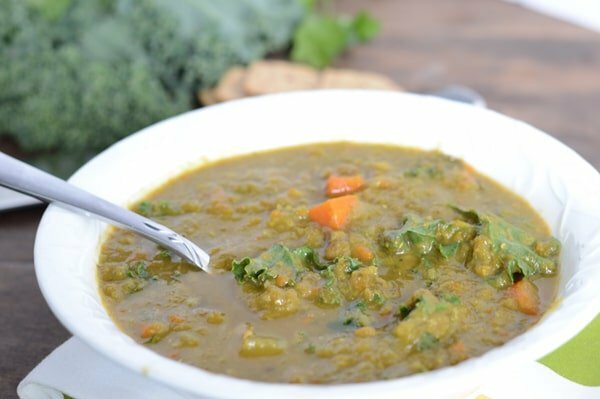 This soup is a true winter comfort food, I got hooked with this one. It is made lighter with ground turkey but very hearty. Load it with vegetables of your choice or follow the combination that I’ve used. 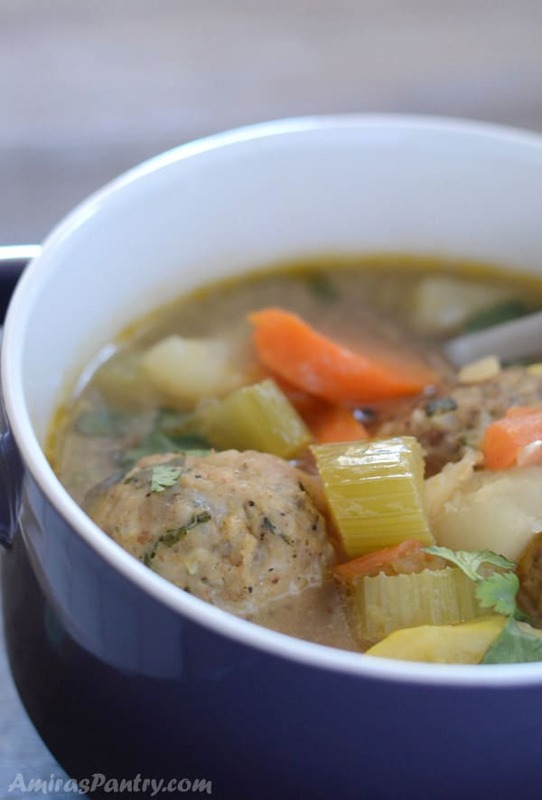 In Egypt, we are not used to meatball soups, in fact I’ve never had one while there.My first and ONLY experience with meatball soups was the Persian Asheh mast which was very delicious. The vegetable combination of this recipe is inspired by our traditional vegetable soup or as we call it in the Middle east Shurbet Khodar. 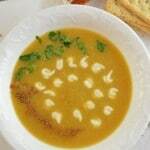 This kind of soup that all moms know is usually given to sick children/adults in the cold winter days. Whenever cold/flu hits, it is what moms offer to cook. 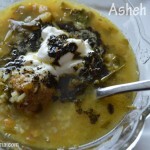 Whenever stomach bug hits, moms cook shurbet khodar, it is kind of a tradition in the Middle east 籠. When you are sick, you cannot find appetite to eat anything. 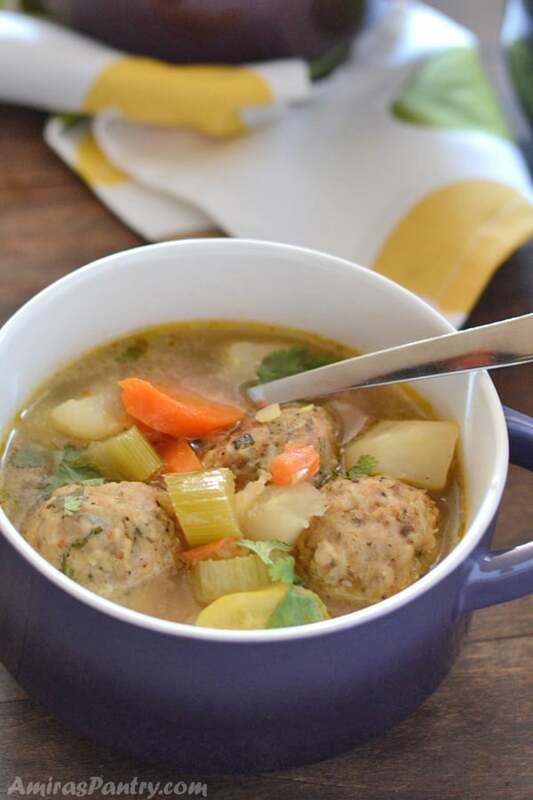 But with a simple bowl of vegetable soup- may be paired with some turkey meatballs- your appetite will show up. This is the epitome of back to basics + simplicity comfort food. 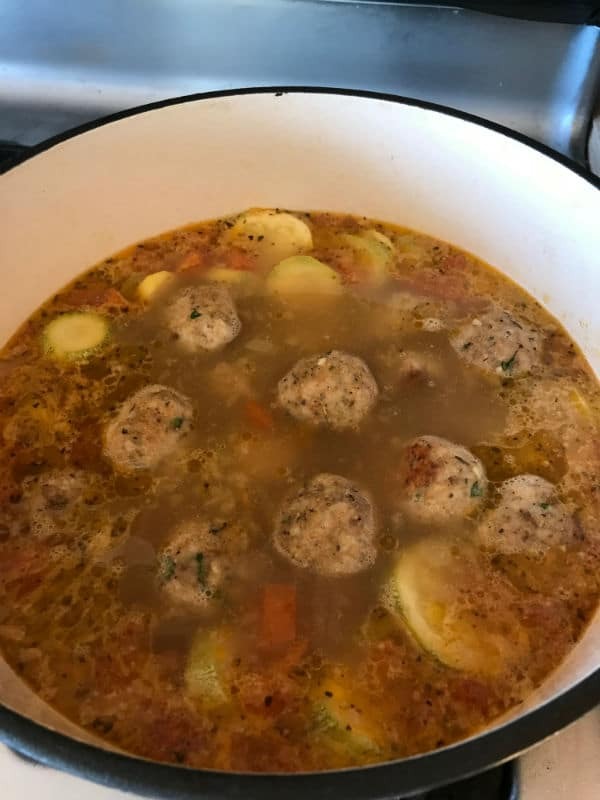 Quickly sauté some vegetables, add broth, bake meatballs, drop them in and all you need to do next is take a bowl and enjoy. Now let’s see how to make it. We’ll start by making the meatballs. 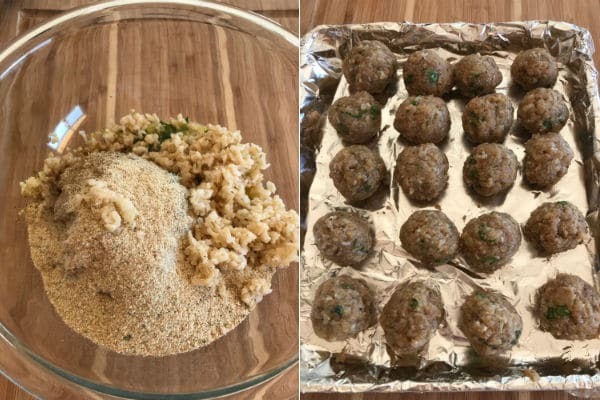 Mix all ingredients in a bowl then form into balls and bake. Traditionally, you form the meatballs and drop them to cook in the hot boiling broth. To make it healthier bake meatballs or cook on stovetop to get rid of all the grease that might come up. Sure, turkey does not have grease like red meat so choose your favorite way of cooking. While meatballs are baking, Let’s cook the vegetables. Sauté onion and sliced carrots in a deep pot for about 5 minutes to allow the carrots to get tender. Add the rest of the vegetables except for the squash/zucchini and stir. Add stock, bring to a boil then reduce heat. Add squash or zucchini then cover and let it simmer until meatballs are done. Drop meatballs in and continue to simmer for 5-10 minutes more. This allows all the wonderful flavors to get to know each other better. Now ladle some in a big bowl, set back, relax and enjoy. 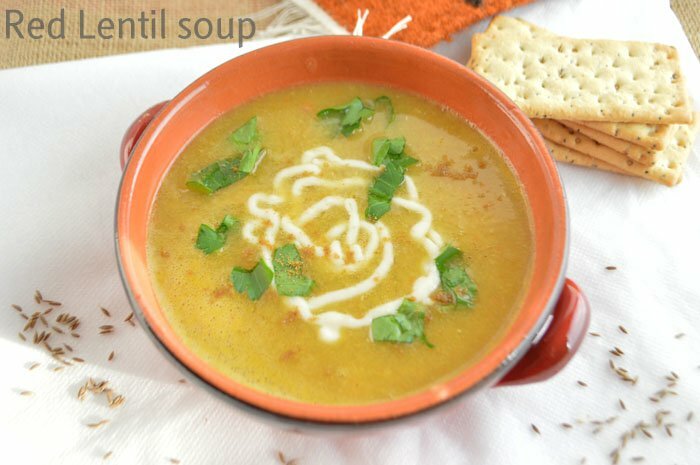 This soup is a food equivalent of a million hugs :). A good and healthy way to start the year after all these cookies. 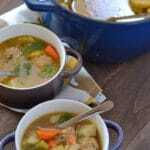 A traditional Mexican soup made healthier with turkey rather than beef. Loaded with vegetables and herbs to pump up the flavors. 1/2 cup cooked brown rice. 1 1/2 teaspoon ground cumin. 1/2 cup celery stalks cut. 3 Medium zucchini or Mexican squash sliced. Mix all ingredients well and shape into 20 meatballs. Spray a nonstick pan lightly with vegetable oil. Heat oil on a large pot or dutch oven on medium-high heat. Add onions and carrots and cook for almost 5 minutes until it softens. Add diced potatoes, celery, tomatoes, cumin and oregano and stir for a minute until fragrant. Pour in the stock, increase heat until it boils then reduce heat and add zucchini, cover and simmer until veggies are almost cooked about 15 minutes. 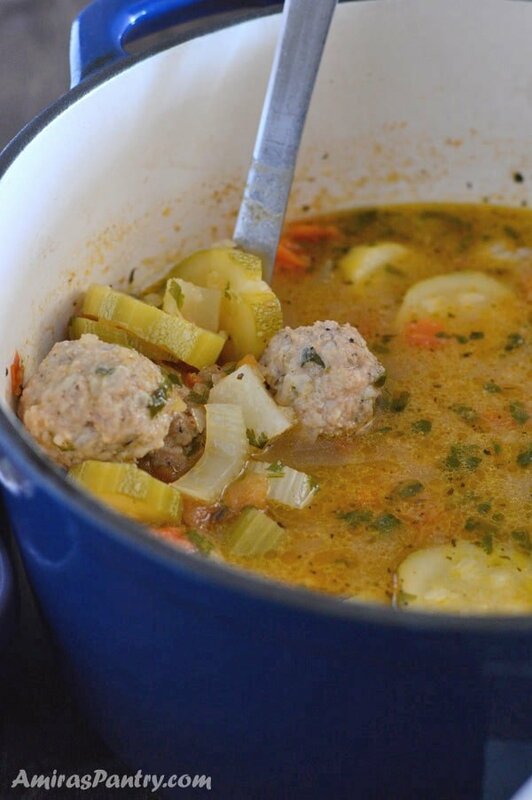 Drop meatballs in the soup and simmer for 5 more minutes. First, I would like to tell you how much I enjoy your blog! You have introduced me to so many wonderful flavors and techniques! 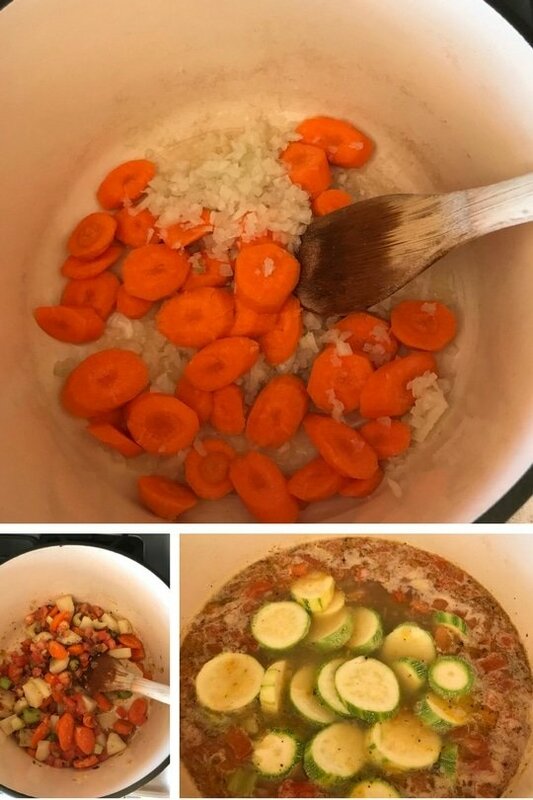 Second, I have question about this recipe: how much stock, and what kind? I don’t see it listed in the recipe. Thank you! Kim, Thank you for bringing this to my attention, I need to focus more and will put it on my new year resolutions .. any tips? :). I’ve used 6 cups of chicken stock. Thanks again and it has been fixed.